Rescued Treasures resale shop helps to support the MISSION of PROJECT PURR, an all-volunteer feral cat advocacy 501(c)3 non-profit organization. Share the fun and unique eclectic vintage and contemporary donated items offered for resale to fund feral "community cats and kittens" spay / neuter via all-volunteer nonprofit Project Purr, a grassroots feral cat advocacy organization in Santa Cruz County, California. Help promote Project Purr's mission by encouraging and educating that feral cats have a right to life. 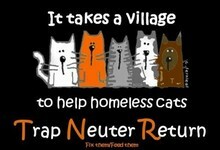 Trap-Neuter-Return is the proven effective and only humane option to reduce the cat overpopulation. Helping feral cats helps all cats! Project Purr works to elevate the status of all cats and dispel the myths around them.